A Customer Can Buy Any Car He Wants as Long as It’s with FIAT’. Well, AutoBay is About to Change That. It was time someone had the brilliant idea of creating a cryptocurrency for selling and buying vehicles. In fact, a whole new e-commerce platform to safely buy, sell and auction vehicles with Crypto is about to be launched. We all have been there, feeling super excited for buying a vehicle, and at the same time feeling terrified for making such high-ticket purchase. Buying a vehicle frequently means large amounts of FIAT currency exchanging hands. The risk of getting scammed makes this a stressful event. Fake escrow accounts, paying with counterfeited currency, VIN number cloning, changing figures of the agreement, false credit application, and bogus hidden fees are only few of the many scam tactics both buyers and sellers are regularly exposed to. · Buyers having a fast, simple and secure way to buy vehicles using crypto. · Private sellers, dealers, manufacturers, or government agencies, to promote, sell or auction vehicles in the global crypto market. · Financial institutions to provide their services to AutoBay’s users worldwide. 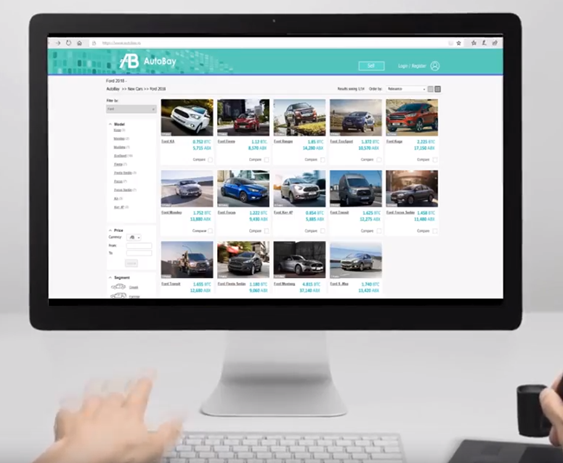 There is a lot to unpack here, according to AutoBay’s Whitepaper, buyers will be able to use AutoBay’s platform to browse for vehicles, shop for financing, and use Bitcoins, Ethereum, or AutoBay cryptocurrency as payment method. For a brief description of the project, see the LightPaper. Since they are launching the AutoBay token (ABX) in the Ethereum blockchain, they will be able to use Smart Contracts to manage transactions. This is very exciting news for the old automotive market. Across the board, it will enhance security, increase speed, and lower cost in trust-less transactions among all parties. ⁃ Have a convenient, secure and simple way to buy vehicles using crypto. ⁃ Access to sellers’ rating record and reviews. ⁃ Manage crypto assets using embedded wallet. ⁃ Promote their vehicles to a global emerging crypto audience. ⁃ Access to professional data tools and analytics to publish, promote, and sell their vehicles. ⁃ Access to prospective buyers’ rating record and reviews. ⁃ Meaningful market statistical data to guide strategy and decision-making. ⁃ Simplified smart contract agreement configuration. ⁃ Easily offer financing to its’ customers from third parties within the same platform. ⁃ Create their virtual Official Store to manage and promote their inventory. ⁃ Access to meaningful prospect customers purchase interests and buyers transaction ratings. ⁃ Integrate their services to AutoBay’s eCommerce platform for seamless transactions. ⁃ Increase their pool of customers -both private sellers and dealerships. ⁃ Sell or Auction vehicles using advance features. To make the world first vehicle Crypto-Commerce platform, AutoBay is developing its’ website and a decentralized application (DApp). They plan to monetize their platform by creating two main streams of income: Paid Vehicle Publications and Display Advertising. For users, this revenue model is very convenient since there will be no transaction fee for buying or selling a vehicle. This is a major incentive for many small dealerships or private sellers to utilize the platform. To encourage users to use the ABX coin, AutoBay will allow sellers to publish vehicles for sale in the platform for free or for a low fee (Bronze & Silver Category) only if they use the ABX token. This will organically generate utilization of the token for most of the transactions. With a large audience, comes the opportunity to advertise related automotive products. AutoBay plans to develop an advertising engine to allow companies to promote their brands, products, events, services and such. Banner ads will be strategically placed in the AutoBay website and DApp. This is probably the largest revenue potential for AutoBay. Many insurance companies, auto parts providers, car manufacturers among others, invest huge amounts of money promoting their products and services. AutoBay’s user base is the ideal audience to be targeted by these companies. Apart from many other ICOs, AutoBay has cleverly designed their model with real-world usage in the form of purchasable vehicles and paid advertising. Currently there are many cryptocurrencies that don’t function as currency or medium of exchange. They lack of real intrinsic value by not having tangible utility. AutoBay Road Map started in 2017, they keep actively working on every stage. Currently they are implementing their Marketing campaign in anticipation to the Crowd Sale. AutoBay is building strategic partnerships to offer seamless integrated features to enhance the user’s experience. Features as vehicle VIN verification, decentralized user reputation, vehicle history, and financing will be available within the platform. By using these partnerships, AutoBay will offer advanced features directly from specialized industry leaders on each area. This partnership with INK Protocol for a seller rating and review integration, is particularly important in the ‘Used Car’ market. Both buyers and sellers will be able to build their reputation as they raise service level to keep a good reputation. They also announced partnerships with Howdoo, Verasity and RedCab. Some other partnerships in the in the crypto finance and decentralized peer to peer lending area are currently in development. There is an auction to reward token sale contributors. 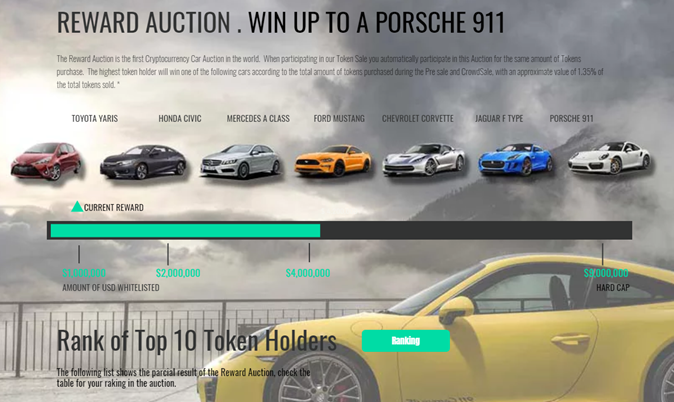 During the Pre-Sale and ICO, investors will automatically be participating in an auction of a brand-new vehicle. There are several price tiers, from a Toyota Yaris in the low end, to a Porsche 911 if they reach the $9,000,000 hard cap. To engage their community, they assigned 3,000,000 ABX tokens for the ongoing Airdrop. They have prices from 10,000 ABX to 50,000 ABX in the community Bounty. In this Airdrop only real people are added, the bot includes some special features like advanced captcha to prevent “robots” to be added and make the telegram group to artificially grow. They also have several incentives and promotions in the pipeline. They have allocated 38% of their funds for their marketing budget. After launch, they plan to focus their efforts mixing online, DOOH and traditional advertising.